The values specified for the size category and data class are mapped to database-specific values via control tables. control as a data item (in the TOP include program for the transaction). CONTROLS ctrl TYPE TABLEVIEW USING SCREEN scr. In the graphical screen editor choose the table control element button. Use the left mouse button to position and size the control on the screen. Then input the name of the table control. To add field to table control, we can retrieve from table or internal table. Click on icon “dictionary/program field window” or function key F6. Mark the field to be added to table control, and then click on push button OK. Drag selected fields into table then release the mouse button. Here the fields we selected will be displayed in reversed order. I do not exactly why it happens. I have tried some ways and tricks to display in correct order, but the fields still displayed in reversed order. Finally, to get the correct order I selected the fields one by one. Label column is text field. To add it, just click on the text field icon, drag it onto header of the column and then type the label. There are a set of programming principles that should be adhered to when using table controls and step loops. Data from the database should be initially loaded into an internal table. This means that the database is accessed for read purposes only once in the transaction. Next the rows of the internal table are loaded into the table control. Any changes that are made to the data are then saved back to the internal table. At the end of the transaction, the contents of the internal table can be written back to the database, again to minimize database I/O. PAI logic for screen 1 (see screen below) loads the internal table with data from the database according to the entries supplied by the user. PBO logic for screen 2 (see screen below) populates the table control from the internal table (buffer). User action in screen 2 triggers the PAI logic. PAI logic updates the internal table with new values entered (into the table control screen fields) by the user. PAI logic is triggered by actions such as scrolling down a single row as well as actions such as BACK, EXIT, etc. Unless the user action causes the transaction to leave the current screen, after the PAI modules have been executed, the PBO modules for the screen are executed again. Thus the table control fields are updated or refreshed after every user action. In PBO processing fields are transported from the module pool to the screen in a predefined order. The table control step loop is processed row by row. Fields with corresponding names are transported from the module pool to the screen. After the step loop has been processed all remaining module pool fields are transported to the screen. The ABAP language provides two mechanisms for loading the table control with data from the internal table and then storing the altered rows of the table control back to theinternal table. Determine which table entry is to be read by specifying CURSOR -CURRENT_LINE. After the read operation the field contents are placed in the header line of the internal table. If the fields in the table control have the same name as the internal they will be filled automatically. Otherwise we need to write a module to transfer the internal table fields to the screen fields. If using a LOOP statement without an internal table in the flow logic, we must read the data in a PBO module which is called each time the loop is processed. Since, in this case, the system cannot determine the number of internal table entries itself, we must use the EXIT FROM STEP-LOOP statement to ensure that no blank lines are displayed in the table control if there are no more corresponding entries in the internal table. READ TABLE ITAB_REG INDEX TCREG-CURRENT_LINE. I IF SY-SUBRC EQ 0. 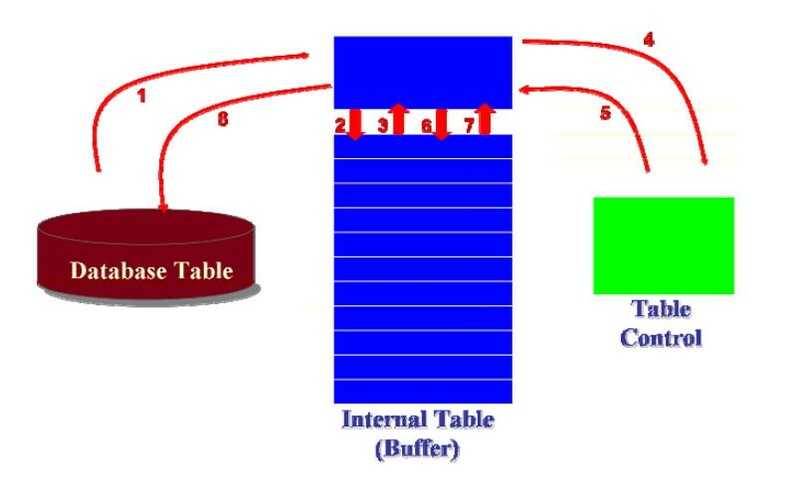 Those are the simple steps how to create table control. What I have learned this week only the beginning. Actually there are more areas in SAP Table Control with ABAP Programming that can be explored deeper, but may be next time.